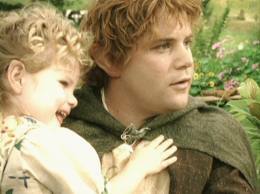 Elanor Gamgee, born in the last year of the Third Age, was the eldest child of Samwise Gamgee and his wife Rosie. She was often called Elanor the Fair as a result of her beauty; she had golden-hair, which was previously uncommon in Hobbits. In her youth, she was the maid of honour to Queen Arwen of Gondor. When she was thirty-one, she married Fastred of Greenholm, and the couple moved to Undertowers (near the borders of the Westmarch) four years later. It was here that the family preserved the Red Book of Westmarch, which had been passed on to Elanor by her father in 61 FA as he left for the Grey Havens and the Western Shores.